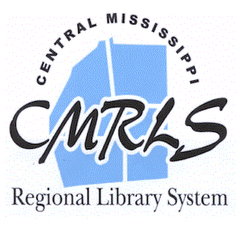 CMRLS News: February Programs at the Pearl Public Library Never Disappoint. February Programs at the Pearl Public Library Never Disappoint. 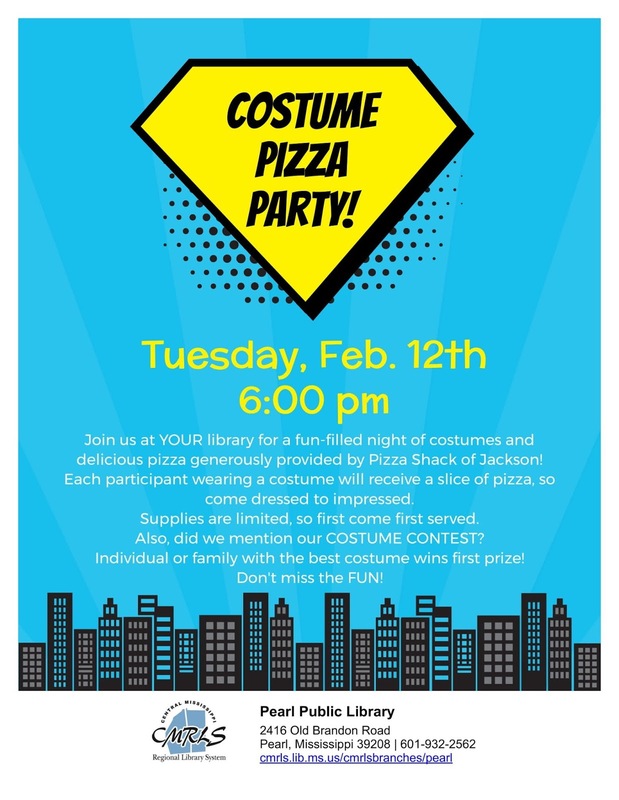 From a great read to Bingo for Books to a Costume Pizza Party, and more, it's all happening at the Pearl Library! And, it's all FREE! In honor of Library Lover's Month, the Chapter 1 Book Club will be discussing Redeeming Love by Francine Rivers on Tues. Feb. 12 at 6 p.m. This book club meets every second Tuesday of the month at 6 p.m. No reservation or membership required. Just stop on by! They'll be happy to see you! 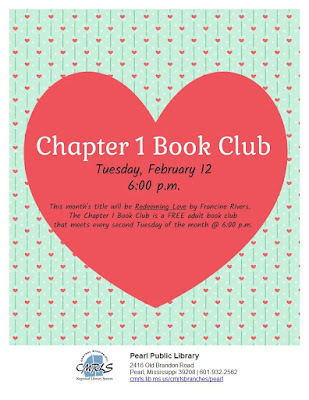 If a book club isn't your thing, come on by the library on this same night Feb. 12 for this month's Family Night program. It's a Costume Pizza Party with pizza provided by Pizza Shack of Jackson. It's first come first served! So, hurry on in and yes, any costume will do! Or, how about a good game of Bingo! It's Bingo for Books on Thurs. Feb. 14 at 6 p.m. This program was brought back by popular demand. And, it is oh-so-popular! 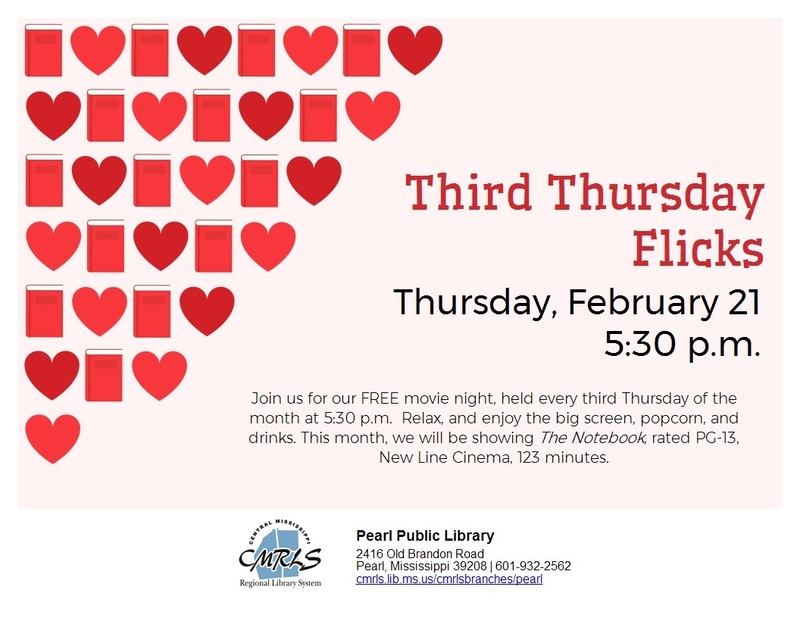 Bingo for Books is every second Thursday of the month at 6 p.m.
By the way, plan to come back the next Thursday for Third Thursday Flicks on Feb. 21 at 5:30 p.m. Watch The Notebook on the big screen and enjoy complimentary popcorn and drinks! Don't forget about the 11th annual Come in From the Cold With a Good Book, the Pearl Library's big Library Lover's Month program. Get free cookies, donuts and coffee donated by Community Coffee, Dunkin' Donuts, the Donut Factory, Simply Southern of Flowood, That Special Touch Cakes, Sam's of Pearl and Wal-Mart of Pearl, on Wed. Feb 13 and Thurs. Feb. 14 from 9 a.m. to 5 p.m. each day!